Like any other part of the house or building, garages have to have that look that matches the place’s overall aesthetic appeal. 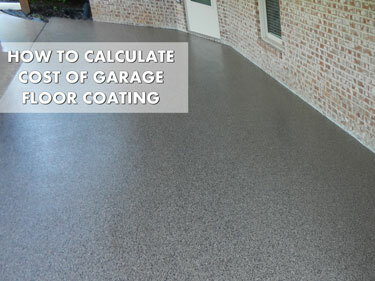 The cost of a garage floor coating could be determined by some of these factors. Usually, the walls and furnishings are what would immediately catch the eye in other parts of the house. In a garage, however, the most important thing to consider is the flooring. This is what absorbs most of the busy work in a garage and is thus more prone to wear and tear. Garage floors must be tough enough to endure the traffic and activity that happens in a garage. That doesn’t mean that it can’t look attractive though. There are numerous flooring options that can be considered if you want to have a good and strong garage floor that is still being visually appealing. You do not have to settle for dusty and dirty concrete. Consider floor coating. product that is affordable yet would give you the best value for your money. Garage floor coating cost varies depending on the type of coating, the size of the garage to be painted, the number of coatings needed to be applied and whether you’ll employ professionals to do the work or rely on a DIY kit. These kits can easily be found in your local paint and hardware stores. It comes with instructions on how to set up and work on your garage flooring and costs less than having professional help. DIY epoxy kits, for example, are around $50 – $600, with 100% epoxy coating kits enough to cover the flooring of a one-car garage costing around $250. Even with its advantages, however, DIY kits have their own share of cons. These kits usually come in monotone colors only, leaving the buyer with no option for more expansive colors that may better suit his/her style or the style of his/her house or building. The preparation product provided in the kit may also not be sufficient enough to fully get rid of the sealers, grease, oil, paint or stains of any other coating material still visible on the garage floor. DIY kits also won’t provide the user with the necessary tools needed to repair small cracks and rough spots on the garage floor in the case where the floor is in such poor condition. DIY kits are more budget-friendly but they can be risky. The difficult part with DIY kits is that it leaves you up to the challenging task of preparing your garage floor for coating, a task that comes with cautions which can be better confronted by professionals. Floor coating is essentially painting over a floor. It’s not as easy as it sounds though. Concrete is just not simply painted over in a couple of hours. It has to be prepared and preparations don’t come easy. In fact, it takes a long time before concrete can be fully prepared for painting. Among the factors that must be taken into account in preparing the floor are holes, cracks, previously applied coatings or sealants and overall dirtiness. Floors must be even, free of moist and spotless clean before it can be painted on. The garage floor coating cost may vary depending on the extensiveness of the preparation procedures. If the flooring is not well prepared, the coating will not bond with the concrete as expected and the whole thing will prove to be a waste. Although non-professionals who want to try out the DIY approach can do this preparation by themselves, the lack of materials and experience may hinder them from doing so as efficiently and safely as professionals do. Preparing and cleaning the garage floor requires the use of specific tools such as grinders and chemical materials such as muriatic acid which, if used without caution, may damage the skin. The floor must be prepared tightly to close perfection before floor coating ever touches it. The DIY approach will surely cut your cost but without knowing how to properly prepare your floor, your garage floor coating will be doomed to fail before the coating process even starts. DIY is thus only recommended for people who have sufficient experience in floor preparation and have fewer than usual issues with their garage floor that must be addressed before coating. There are two common types of coating that can be used to paint on garage floors: concrete paint and epoxy. They are further divided judging from what materials they are based on – concrete paint can be made from oil or acrylic latex, while epoxy comes in a wider variety of options such as pure epoxy coatings and water or solvent-based coatings. Concrete floor paint is the cheapest among these options. It is basically a more durable version of the usual paint used on walls and ceilings. Its appearance may differ depending on what the paint is based on; oil-based paint has a more glossy appearance and is considered to be stronger compared to latex-based paint, but it is also more challenging to apply. At around 15 cents per sq. ft. or less per coat, concrete paint is a sure money saver. Generally speaking though, when it comes to garages, concrete paint is not as durable as expected of garage flooring. It is prone to being damaged by chemicals and hot car tires. It also requires retouching more often, unlike epoxy coating. If you’re looking for the perfect combination of toughness and appeal, epoxy coatings are definitely the way to go. Epoxy coatings are popular and are considered to be the standard for garage floor coatings. This is the favorite among professional garages, warehouses and car showrooms and for good reason. First, it is very strong, having the durability that can withstand usual garage materials, chemicals, grease and oil stains, scratches and wear and tear. Depending on the type of epoxy coating, they can be about 3 to 10 mils thick. Secondly, it looks gorgeous, with a glossy finish that is sure to add more flair and style to the overall look of your garage. It comes in a variety of colors too which can make your garage floor stand out just the way you want it too. Epoxy coatings are a highly recommended suggestion that will surely satisfy your need for a durable and beautiful-looking garage floor. As such, however, those looking into epoxy coatings will have a considerably higher garage floor coating cost. There are three main types of epoxy coating: 100% pure epoxy, water-based epoxy coating and solvent-based epoxy coating. Water-based epoxy coating has the lowest price among the three but it is also the weakest and least durable, though it can still sustain scratches, blows and chemicals to a certain extent. Unlike two-part 100% solid epoxy coatings, water-based epoxy coatings contain only about 40% – 60% epoxy. They are thinner and are thus easier, quicker and more convenient to apply. However, they also need constant re-application. Water-based epoxy coatings can cost around $30 – $50 a gallon. Solvent-based epoxy coatings are slightly stronger, thicker and more durable than water-based paint. Their application can be done in lower temperatures. However, this requires the use of respirators because of their high VOC (volatile organic compounds) content. Aside from these factors, like water-based epoxy, they are easier to apply and are more favorable for those who prefer the DIY approach. A gallon of solvent-based epoxy coatings costs around $45. 100% pure epoxy coating is the toughest and most durable of these three. These are two-part coatings that result in very hard and thick flooring. However, they are more suited to be worked on by professionals because of the difficulty in their application and thus are not preferred by those who want to go DIY. 100% pure epoxy coatings are commonly used in professional garages for their ability to resist hot tires, scratches, oil and chemical spillage. They are also prized for their longevity and can last up to twenty years. Because of these qualities, 100% pure epoxy coatings are the most expensive. Prices for a gallon of 100% pure epoxy paint range from $45 – $150. Professional installation of these floor coatings are about $1.50 for a single coat per sq. ft. Because multiple coatings are required for the best and hardest flooring results, epoxy coating costs around $3 to $6 per sq. ft. For a typical 2-car garage, the total cost for installing pure epoxy coating ranges from $1,000 – $1,800. Despite the high price however, those who use epoxy coatings for their garage floorings are sure to get their money’s worth. For a long time, epoxy coatings were the best option when it came to garage floors. As popular and renowned as epoxy coatings are, however, they also have their own share of weaknesses. For example, while epoxy can absorb scratches, hot tire marks and abrasions, they are not U.V. resistant. Eventual discoloration is common when epoxy coatings are exposed to sunlight. And despite its long-standing reputation as the strongest and most durable material when it comes to garage floor coating, recently a new type of coating is challenging epoxy. Polyaspartic coatings are gaining recognition today as a floor coating option that can stand toe to toe with epoxy coatings. Many are turning to polyaspartic coatings for their flooring needs because of the advantages of these coatings over epoxy. Polyaspartic coatings can be applied under any common climate and temperature. Unlike epoxy coatings, they are completely U.V. resistant and will not discolor when exposed to sunlight. In terms of visual appeal, they also appear in a smooth, clear glossy finish and can come in a variety of colors. Application is notably easier and takes less time than when you’re applying epoxy coating – polyaspartic only needs two coats as opposed to epoxy coating which may require multiple coats. Yet, similar to epoxy coatings, they are also non recommendable for DIY practitioners and would be better applied by professionals, especially since its application would require respirators to be worn by workers and special equipment. Performance-wise, polyaspartic coatings are considered to be more durable than epoxy coatings. Although they are thinner than epoxy coatings, they are also more flexible and thus can better absorb impacts. They have a higher tolerance for scratches, marks, chemicals, stains and heat. They also have very little, if absolutely no VOC’s which reduces risks during installation. In terms of longevity, polyaspartic coatings will last as long as the garage lasts while requiring the very least of maintenance. These qualities make polyaspartic coatings a new favorite among professional outfits. It goes without saying, however, that by possessing the all-around best that floor coating can offer, they are also the highest when it comes to garage floor coating cost. Polyaspartic coatings cost close to around $5 – $7 per sq. 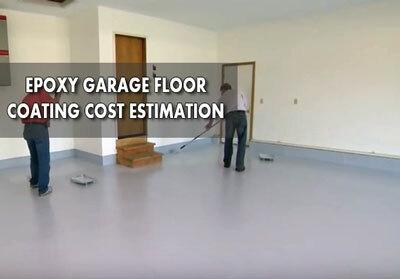 ft. With Polyaspartic coatings, the estimated cost needed to cover the flooring of a typical 2-car garage would range from $2,000 – $2,800 which is twice that of epoxy coatings when used for the same purpose and with the same size of flooring coverage. When you want to make sure that you are not spending unnecessarily for your garage floor, you just have to keep two main factors in mind: the type of coating needed and mode of work (DIY or Professional). DIY is cheaper but won’t guarantee for everyone a properly prepared floor required for applying the coating, unlike professional work. As for the coatings themselves, concrete floor painting costs less but is not as durable as the widely used epoxy coatings. Epoxy comes in water-based, solvent-based and 100% pure epoxy variations, with 100% pure epoxy being the toughest of these coatings and thus the priciest. Polyaspartic coating is a new type of floor coating that is making the rounds as the best type of coating available but it is also the most expensive, with its price reaching twice that of epoxy coatings. It is important to consider these options carefully when selecting a type of coating for your garage floor. There are numerous options with how garage floor coating can be done but ultimately, the goal is to search for the perfect balance between appearance, durability and affordability.